For 25 years the annual festival known as New York Is Book Country has created an oasis in the heart of the publishing world for readers and writers alike. Much more than a catch phrase, it has grown into a cherished occasion in the lives of countless book lovers. Cynthia Ozick recalls in verse the traveling library van that trucked books to her "end of the subway line" neighborhood in the Depression-era Bronx. We learn of the conversation in a Third Avenue bar that led Nelson DeMille to pen one of the first novels on the Vietnam War. Lawrence Block explores the challenge of writing about the most constant character in his fiction—New York City—in the wake of 9/11. Donald E. Westlake considers New York's fastest growing export—books—and the hilarious pitfalls of translation. Ken Davis recounts his unlikely journey from bookstore clerk to proud author of a series featured at a New York Is Book Country booth (and how underwhelming his teenage son found the sight). Robert Lipsyte relives his visits to the Queens Borough Public Library with his father. Susan Isaacs pays loving tribute to her mother's "circle of light" reading sanctuary. Edwidge Danticat muses on an inquisitive French girl's ability to help her feel as at home in New York as she did in her native Haiti. Ruth Reichl recalls traveling the world while eating homemade lunches prepared by her schoolmates' mothers. 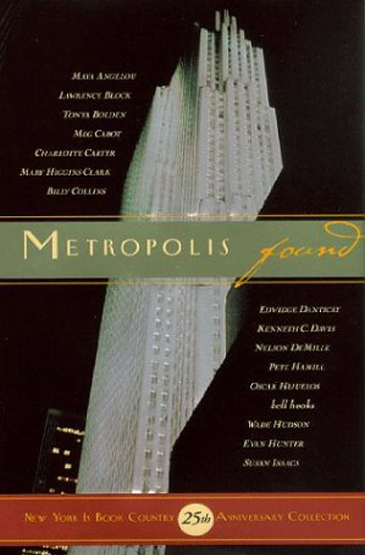 With original never-before-published contributions from more than 25 prominent writers as well as a keynote poem by Billy Collins, Metropolis Found is an alternately joyful, poignant, funny, and thoughtful celebration of books, New York, and the annual fair that reminds us how vital each is to the other.